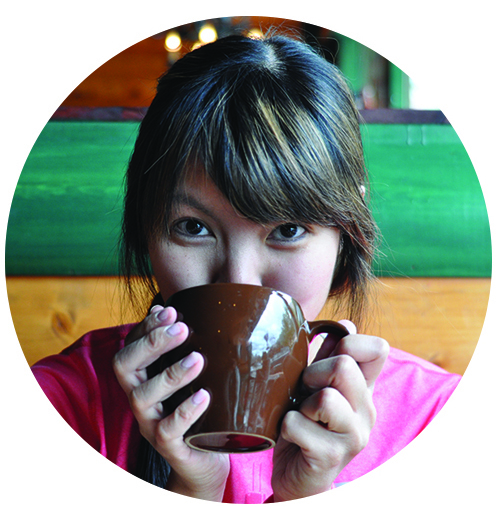 I’ve already mentioned this numerous times on my personal blog, but the food blog is a new stage! I’m going to Paris in May! The plan is to spend 3 days in Paris, 2 days in London, 2 days in Amsterdam, and a 17 hour layover in Istanbul. We are booking our lodging and airfare piecemeal due to budgetary constraints. 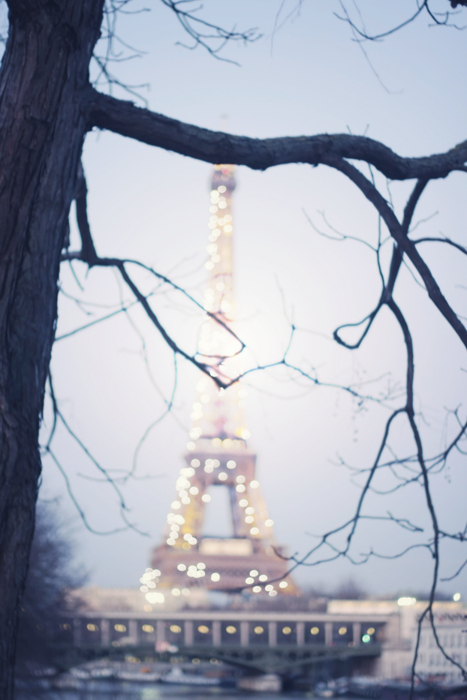 Today, we booked our first three nights in lodging in a darling studio apartment in Montmartre, Paris. I cannot wait and really enjoy the planning process of a trip. Since I’ve had this as a concrete goal since last year, I’ve become more of a Francophile. 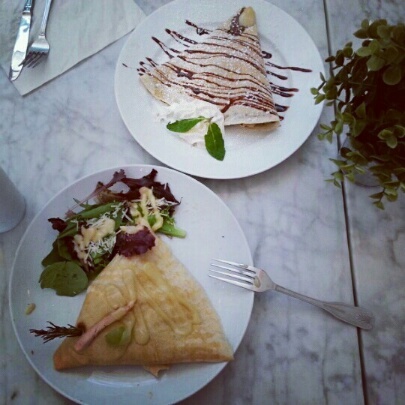 More croissant dates and crepe dates! On Christmas Eve, my friend Dave and I had our second French inspired date in just a month’s time. He chose a creperie in Houston aptly named Sweet Paris. 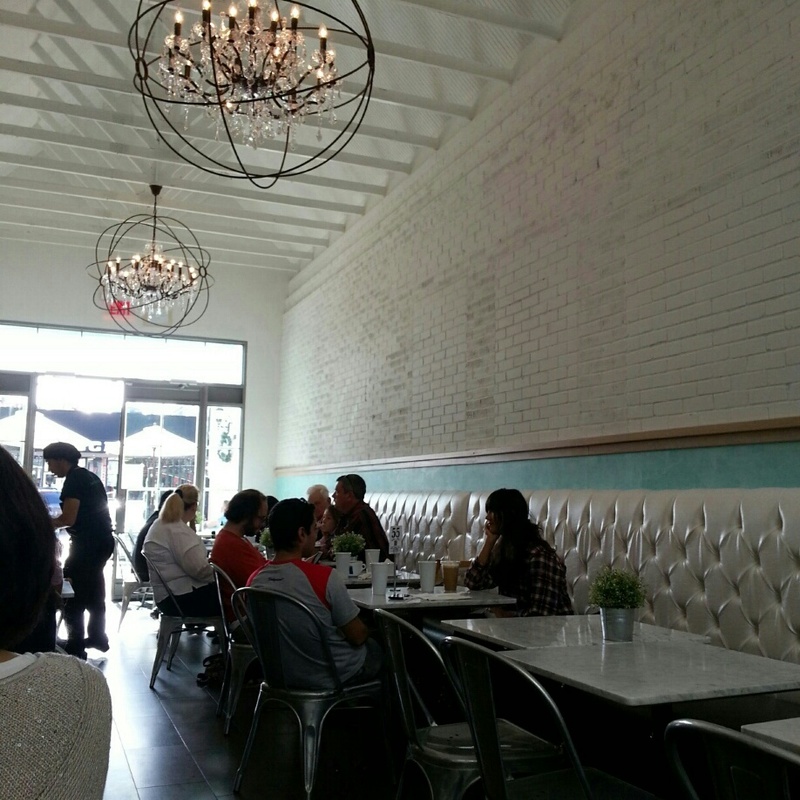 Located in Rice Village, this space was light and airy and reminded me a lot of eateries in New York with the narrow floor plan. Or Cafe Medina in Vancouver. 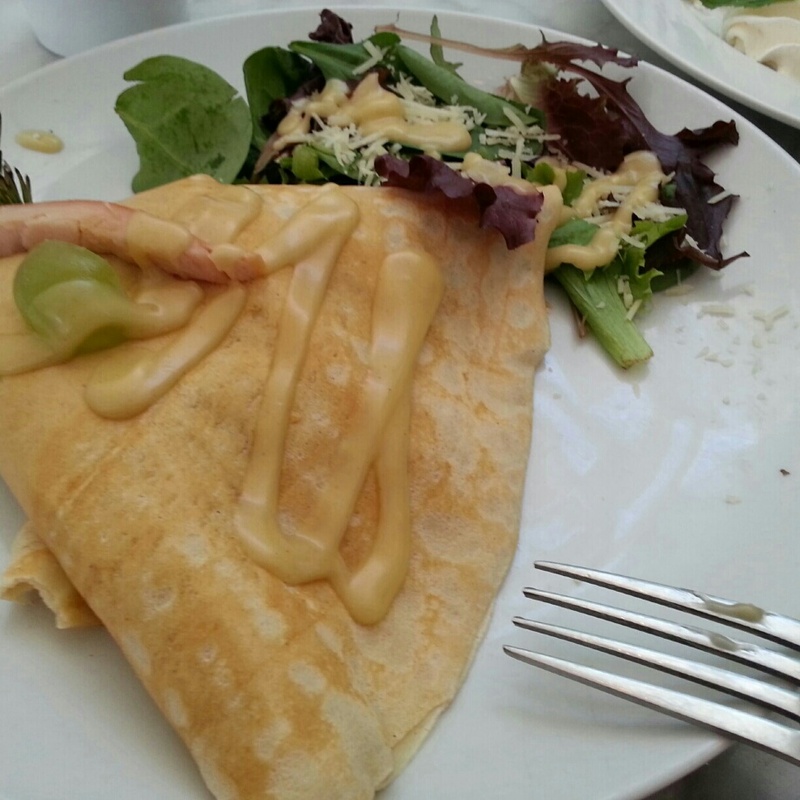 I ordered the turkey, grapes, and brie crepe. A great combination for a crepe filling and I cannot wait to experiment with grapes in a savory context in my home cooking. All savory crepes come with a small side salad. It was a decent crepe! The crepe was fluffy and warm and the filling was almost perfect. The cheese could have been a little more gooey. Dave ordered a nutella crepe. Sure for two dollars you can make all the nutella crepes you want at home, but the beautiful presentation of Sweet Paris’s crepes has a luxurious feel to them. Also, I love that their business gives back to the world community. 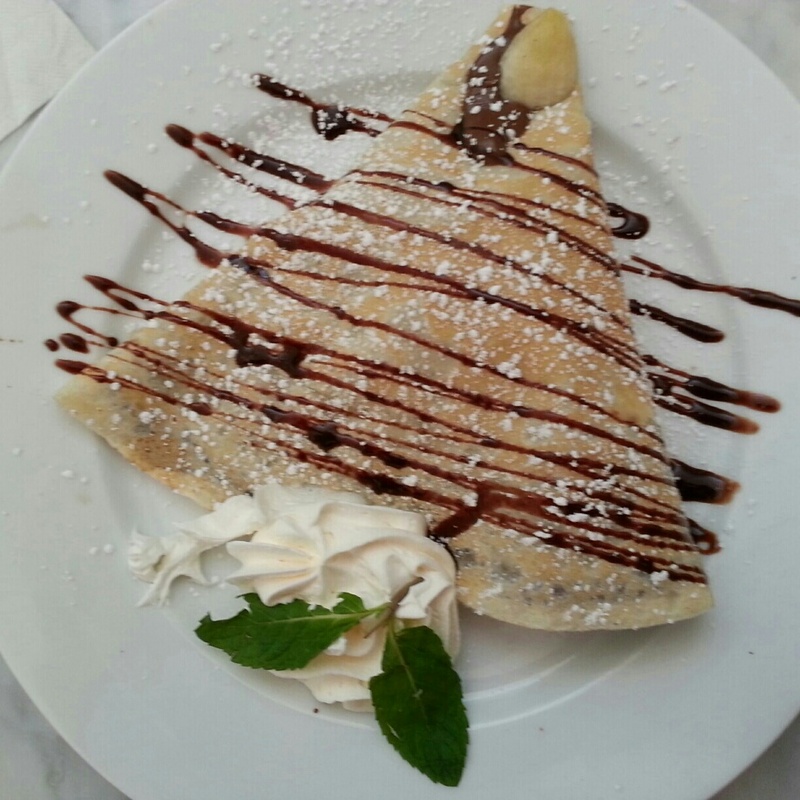 For every crepe purchase, Sweet Paris donates one school meal to a child in need through the U.N. World Food Program. How lovely is that? It warms my heart and makes my stomach happy.